If it's kinda creepy but more than a little cool, it's got to be by Mateusz Skutnik who wants to take us on another trip to the eerie world of Daymare Town with Daymare Cat. This time, it's a platforming puzzle adventure game where you're tasked with guiding our disheveled and befuddled looking heroine through the Town's twisting streets. Use the left and right [arrow] keys to move, and hit the down [arrow] to interact with things and go through doors. Any items you gather are tucked away into your inventory at the bottom of the screen, and the game will automatically use the correct object in the proper place for you when you press down in front of it. If you've never been much for Italian plumbers, don't worry... apart from a few simple sequences, Daymare Cat is less about platforming than it is about exploring and puzzle-solving. Despite featuring the familiar etched lines and otherworldly architecture, this doesn't quite feel like a Daymare Town title, and it's not just because it isn't a point-and-click. It feels a bit less light-hearted and fantastical, lacking the familiar critters and characters, and much more surreal and mysterious. While solving puzzles is largely a case of flipping levers and keeping your eyes peeled for little clues, it's almost an Alice in Wonderland type experience as seen through the eyes of Mateusz Skutnik. Cat Jahnke's music, when you discover it, is both incredibly varied and a pleasure to listen to, but not every piece fits the mood and overall setting of the game. Which is, you know. Something where you sort of expect to see Slender Man standing politely just barely out of frame in a window. Waiting. Always watching. It's that almost-but-not-quite-freaky vibe that makes Daymare Town so incredibly addictive. That, fortunately, is definitely intact even if the puzzles wind up being fairly straight-forward. Use this key here, climb those platforms there, throw yourself down the hungry gullet in the floor over nyoh. Finding the music in the form of records largely winds up being the whole point of the game, and since the game lacks a map, it's easy to get lost of where you've been and where you're going. With a rich style and setting, however, getting there is still going to be a lot of fun, even if it isn't exactly what you expected a Daymare title to be. Daymare Cat Walkthrough now available! 1. You start off with the "tutorial" controls (arrow keys) right above your head. Just keep going right and jumping until you get to a crank, press down to activate it, then press left to see that a platform has been lowered. Jump on it and jump above the screen. 2. Once you have exited the hole, go to the far left and get the SIMPLE KEY. Go right again and past the hole you entered. 3. There should be a stump with a hole in it, and a down arrow above it. Press down to use the Simple Key. Move to the doorway and press down to enter. 4. You are now in a tunnel. Going to the dark doorway reveals a room with a phonograph in it. There's nothing in the room right now, so exit and go to the right. 5. Keep going right until you exit the tunnel. Down below on a balcony, you can see the FIRST RECORD. You can't get to it yet, so just keep going right. 6. Time for a little platforming fun! Just make your way over to the right side of the screen using the pillars. Don't worry if you fall - you don't lose anything and you start back at the left side of the screen. Once you hit the other side, keep going until you see a doorway, and enter it. 7. Go to the far right and you will see a door. You will also see a hole that, if you try to interact with it by pressing down, seems to be missing a handle. Nothing else here, so keep moving to the right. 8. You will find another crank. Operate it, then go all the way to the left until you hit the platform screen again. 9. Jump on the ledge above your head to the newly-flipped platforms to get the TURN HANDLE. then go back to the right, through the doorway, to the closed door and put the handle it in its place. Go through the door. 10. You will see another record above your head on a balcony. Go right to the next screen and see a phonograph. Go right once more to a large door with five trumpets sitting above it. Use the two bricks as platforms to get to the doorway above the large trumpeted door, and enter. 11. Go to the far right first, skip the doorway, and collect the PYRAMID on the shelf. Turn around and go through the doorway you passed on the way. 12. Go to the far left on the balcony to collect the SECOND RECORD. (Don't worry, you'll get the first one eventually). Instead of putting this record in the phonograph underneath this balcony, put this one in the phonograph in the dark tunnel at the beginning - it will save you a ton of backtracking in the long run. 14. Do the platform puzzle, go to the right, and enter the doorway. Use the gray "bricks" to climb above the screen. The next screen will be the same thing, but with a bell. Use the support beam for the bell to go to the left. Then, use the support on the left and the demon's tail to get on the platform, then use the demon's back to get the THIRD RECORD. Go back to the bell and simply fall down the middle to get back out. 15. Go left, back over the platforms, and out the door to the broken doorframe. Go left to the phonograph and use the third record on it. Then, leave this area and get back to the trumpeted door. 16. This time, go right. Use the pyramid on the pedestal next to you to flip the other platform around, then go up and onto the gazebo roof. 17. This one's a bit trickier because the platforms move - but really, you're aiming to land in the mouth at the bottom of the screen anyway. So don't worry about getting over to the other side quite yet. 18. Once you have landed in the mouth, go right two screens to see the FOURTH RECORD. There is a platform there so you can get to it. Once you have it, go right two screens into daylight. Continue right until you find a trampoline, and use it to go to the left platform. 19. Use the fourth record on the phonograph, then go right again, using the trampoline to go right this time. Move to the middle platform, then left to the doorway, and enter. Grab the first record (told you we'd grab it eventually!) and exit. 20. Use the trampoline to reach the second trampoline, and go up. This platformer uses trampolines; you need to grab the CROSS KEY on the right side of the screen, and exit at the top left side of the screen. 21. When you land, go right to grab the FIFTH RECORD. Then go left two screens to another locked door, and use the cross key on it. Go inside and use one of the records on the phonograph. Once you've done that, exit and go left. 22. Jump back over the moving platforms to the left side. If you fall, just try not to land in the mouth, or you'll have to do the whole trampoline puzzle again to get out. Once you land by the pyramid's pedestal, go left to the final phonograph, and place the record on it. Hi this is my first time writing a walkthrough :) hope it is clear! 1. You will only need your arrow keys. 2. Vinyls can be placed in the old record players without any order. 3. Strongly recommended to wear your headphones for the most optimal gameplay! 1. Walk to the right. 2. Jump to go past the crate. 3. Press down to interact with the wheel. 5. Jump on top of the crate, and then to the left platform, and jump up. 6. Go left to get the key. 7. Go right twice, past the 2-wheel platform where you came from earlier. 8. Press down at the plant-thing to put the key. 9. Press down at the entrance to enter the tunnel. 1. Press down at the black-shaped entrance to go into a mini cave. 2. Press down at the old record player. You will be prompted that you need to have a vinyl. 3. Go back to the main tunnel. 4. Go right and straight to enter the outskirts of the town. 1. Currently you can't reach the vinyl below. Don't worry about it, you will reach it at the later part of the game. 2. Go right and you will see that the floors are broken. 5. Press down to enter the building. 2. There seems to be an entrance. 3. Press down at the hole on the left side of the door. You need to get a wheel-key to open the door. 5. Press down to interact with the wheel. Look at the window to see that something has turned. 6. Go left twice, and walk through the door to exit the building. 1. Go left twice back to the place with broken floors. 2. It seems that the turned things are actually new circular platforms in the middle of the screen. 3. If you don't know where to jump, look at the background of the game, and ignore the 2 pillars from before. Focus on the long plank and the 3 circular platforms in the middle-top of the game. 4. Jump to the long plank, and the platforms to get the wheel-key. 5. Go right twice, and enter the building. 1. Go right, and press down at the hole to insert the wheel-key. 2. Enter the door to the back of the building. 1. The vinyl can't be reached from where you are, so go right. 2. There's another old record player and a door at the top. Nothing to do here now, go right. 3. You will see a fancy door with 5 pipes above it, and a small window. 4. At the most left pipe, there's a small step. Jump up to it, and up to the other small step a little left. 5. Jump to the window and enter to reach the second floor. 1. Go right. Enter the door with 4 wheels. 3. Go right and back to the door with 4 wheels. 4. Go right. Jump up to grab the rotating triangular key. 5. Go left 4 times. There is an entrance, but let's ignore it first. 6. Press down to insert the vinyl and enjoy your first bit of music. 7. Go right to enter the entrance. 8. You will see a mixture of pillars and floating circular platforms. 10. Enter the door to the bellhouse. 1. It might be pitch dark in here, but look closer. There are small grey steps leading to the top. 2. Jump your way to the top. If you are unable to reach the top, just jump to the highest-third step and press up. You will be automatically moved to the top. 4. Go left. You will see a monster with a vinyl on top of its head. 5. Jump to the left to the wood pillar. 6. Jump to its tail. 8. Go right, down and exit the bellhouse. 1. Go right twice. Enter the door with 4 wheels. 2. Drop down to the first floor by going right. Insert the vinyl and hear the second bit of music. 3. Go right. Look at the pipes. 2 of them are currently playing music, and we inserted 2 vinyls, so there must be 5 old record players in total. 4. Go right, and press down at the pillar to place the triangular key. This activates the circular platform to turn around. 5. Jump up to the roof on the right. 1. More platforms, but this time they're moving! 2. Drop down to the mouth to enter the monster. 1. Really pitch black here. The left way is blocked, so go right. 3. The monster actually ate a vinyl! There're hidden platforms here, so just jump up in the direction of the vinyl to grab it. 1. Go right. Jump on top of the cushion. It bounces! 2. Bounce your way to the left platform on top. 3. Place your vinyl in the old record player and listen to your third music. 4. Go down by falling left or right. You're back at the exit of the monster. 5. Go right and bounce right to the wall. 6. Before you bounce up, enter the door at the lower left. 7. Grab the vinyl from the beginning of the game and go back. 8. Jump up to the cushion, then to the balloon-cushion into the sky. 9. Look to your right. There's a rotating key. Grab it. 10. Bounce your way to the highest balloon-cushion at the top left. 1. Go right, grab the vinyl and go left twice. 2. Press down at the triangular shaped door to insert the cross-key. Enter the dome. 3. Insert the vinyl in the old record player and it will play the fourth music. 4. Leave the dome and go left. 1. Go left. 4 of the pipes on top of the fancy door are playing music, but there's still one more vinyl on your hands. Remember the first old record player we saw? It's time to go back. 2. Go left twice to enter the building. 1. Go left and exit the building. 1. Go left 4 times to enter the tunnel. 1. Go left, and enter the black-shaped entrance. 2. Insert the vinyl and listen to the last music. 3. Exit the cave and go right twice. 1. Go right twice to go back to the building. 1. Go right once and enter the door. 2. With all 5 vinyls inserted, the door is open! 3. Enter the door to view a short clip. The 5 vinyls that you have collected are actually 5 different parts of the song, which is combined when you entered the door. Placed 4 records, can't find the last one for love nor money and I appear to have been everywhere I have access to. I could not ask for a better fantastical romp this afternoon. Superb drawings/gameplay/music. ...access the option to download the complete song. Now that I've finished it, it's just a promo for a song. Wasn't connected to the previous Daymare Town games other than sharing the line art. 1st was on that lower balcony, 2nd was on the upper balcony further on, I found another in some metal framing and one inside a monster. The only seemingly pointless room I found was a tower which was dark inside. POP! Found one record I could get by the demon, but that's it. Can't judge the music without sound, haha. But if it is a vehicle for the music, no harm in saying so in the review; FLF is still one of my favorite Submachines despite its being an advergame. The platforming controls are indeed squirrely, especially if you've never played Skutnik's earlier offerings. But I'm just used to it, so it wasn't a huge minus for me. Is that... have I seen that guy before? No, not floating smoker guy. I almost want to break out the previous Daymare and take a look at Embassy Girl because the style is fooling me into familiarity. Wheee! Love how he's playing with the 3D concept in 2D. Some of Pastel's best work is when the storyboard depicts a 3D environment. Pretty straightforward overall. Actually the cutscene was the creepiest part for me because it was so very anti-Daymare. @Dora - I've only written a few walkthroughs in my time (like the Bow Street Runner walkthrough way back in 2008), but I know how frustrating it is to get stuck on things. :) And I totally understand on the Skyrim thing! As far as this game goes, I really love Skutnik's older stuff, so I'm super glad he's still making things. I remember playing the first Submachine long ago! (I was only about 15 years old then - time sure flies!) While I agree that Daymare Cat is a bit short, that's kind of the charm of it. I love that this game was easy to waste a few hours on during my morning coffee, without being really aggravating; most platforms I play end up rather horribly so it's nice that the platform part is fairly forgiving. The controls are a touch slippery but after a few minutes you seem to get used to it. I had fun with this! I liked the song, and the art was beautiful as always. I'm still keeping my fingers crossed for a full Daymare Town game soon! I loved the little heroine in this - so cute. Can't wait for the next full Daymare installment. Only downside to this is that your game doesn't save, which I discovered when I tried to return to the game I'd played half-way through. fall into the hole/mouth thingy, if you go right you get outside, but if you're like me and you want to explore and you go back into the dark to see what's at the left side, you suddenly find yourself stuck. No amount of jumping or arrow keying gets you out. So i guess i'll have to start over. Posting this as a warning but how will you know unless you're willing to see the spoiler. Otherwise, fun like all the daymares and other Skutniks. I absolutely love Skutnik's atmosphere in his games, and the music of Cat and the Menagerie just added that much more. Thank you so much to everyone involved in the development for creating a piece of art I would otherwise have never experienced. Much love. In terms of gameplay, I felt it was just right. No complaints at all. This could easily turn into a much longer game, and I would be happy to play it and pay for it. Er, wildturnip -- if I'm not mistaken, you can't get out there, but you can get back there, the way you came in. No need to restart. oh no. i saw new daymare and thought oh wow a new pastel games :D . but no i had to stop half way .... sorry. a platformer?! whut.... ! no. anyway, youre illustrations were great as always though. Bar Dee- this isn't the first time Mateusz has had a Daymare-style platformer. Have you played his New Year's games? Is that Kara from the Covert Front games? If anything he looks like the Revenge guy in Daymare Town 2. But I'm still searching, he does look really familiar. By the way, has anyone figured out the rooftop contraption in Daymare Town 3 yet? Speaking of enduring mysteries. Well, Loved the game. 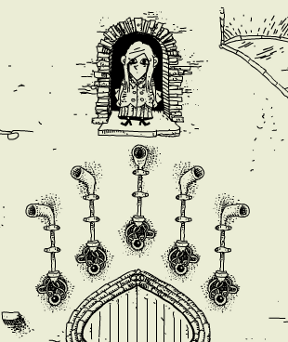 I never seem to get through an entire Mateusz game without use of a walkthru. But it's all good. I've got this beat, except for the tail. It's just not catching. I don't know whether I've encountered a glitch. I'm not using the latest Adobe flash. It won't work right on my pc, so I use one a little younger. Windows 7. Plenty of ram. Toshiba satellite laptop. I dunno. Okay. Me again. I no sooner whined when I returned to the game and finished it. There's a trick to the move. But it's not overly complicated. It just takes a bit of persistence. That should save others wondering whether they too are experiencing a glitch. I was a little annoyed when my internet connection died just as I was about to download the file. Oh well. That guy from the end is the main character in..
...And I couldn't have been more pleased! (Well, okay, Submachine 9 would've made me happier. But doubtless also more frustrated.) I've always been fond of platform games, having grown up with both those and text adventures being the best then-current tech could offer in terms of enjoyable gameplay. Years later, I find I can't enjoy roughly half of the platformers that come out, because I just don't have the reflexes for even many of the games considered only moderately difficult. The bit of platforming required in Daymare Cat was only occasionally at all challenging for me, and the fact that falling off the bottom of the screen due to a missed jump only set me back a matter of seconds made the 'try, try again' part of success much easier than in many other platform games. The music was quite nice, even if not all of the tracks really seemed to 'fit' the setting, and I was glad to have the opportunity to download at least the one song after completing the game. Like some other players, I had to resort to the walkthrough when, despite having found all 5 gramophones and 4/5 records, I was stumped for where else to look. As had been the case for at least one other player, the problem was that I had mistaken a navigable door for mere window-dressing. I'm not sure that necessarily indicates a fault in the game's design, though, as opposed to in us players' determination to explore everything in sight. Finally, I feel I should reiterate what a few others pointed out above: You'll know when the ending cutscene is over, so don't click away (or close the tab) until you're certain it's finished! I thought the girl was Elizabeth, and the dark-haired guy was pre-Submachine Murtagh.